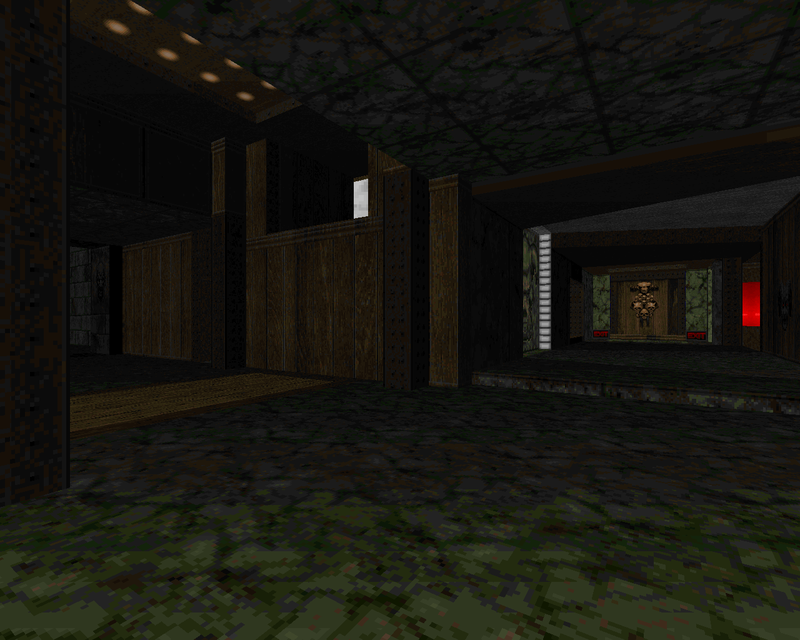 Memfis has a lot more going on than being a dude who makes tightly-balanced maps with relatively light action. To be fair, though, it seems like the sort of gameplay that he tends to target. Green Day is no different and thus follows in the tradition of Kashimir which he published earlier during the same year in 2011. 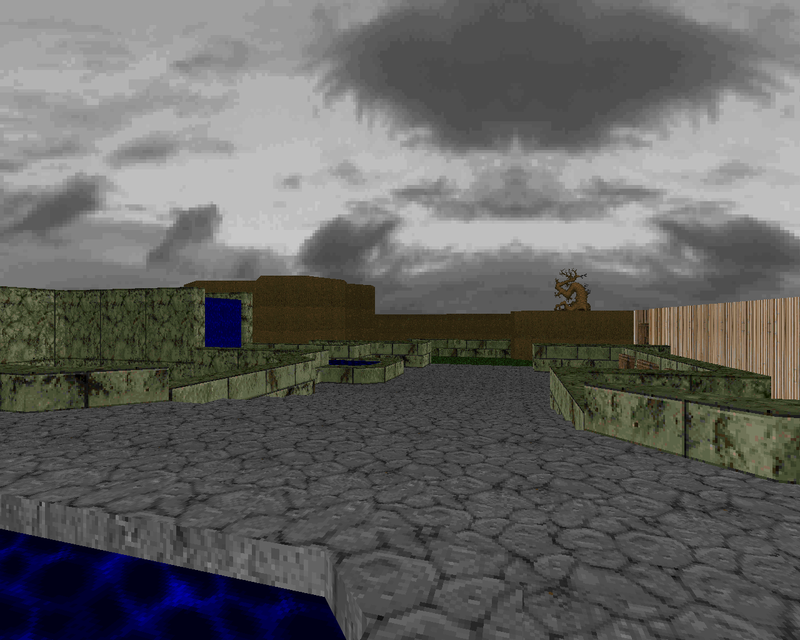 This minisode for The Ultimate Doom was meant to be played in limit-removing ports and features two levels in the first couple of slots for Thy Flesh Consumed. They're linked by theme and have an intro map / main attraction dynamic going on but the author has elected to exclude any sort of a framing narrative. 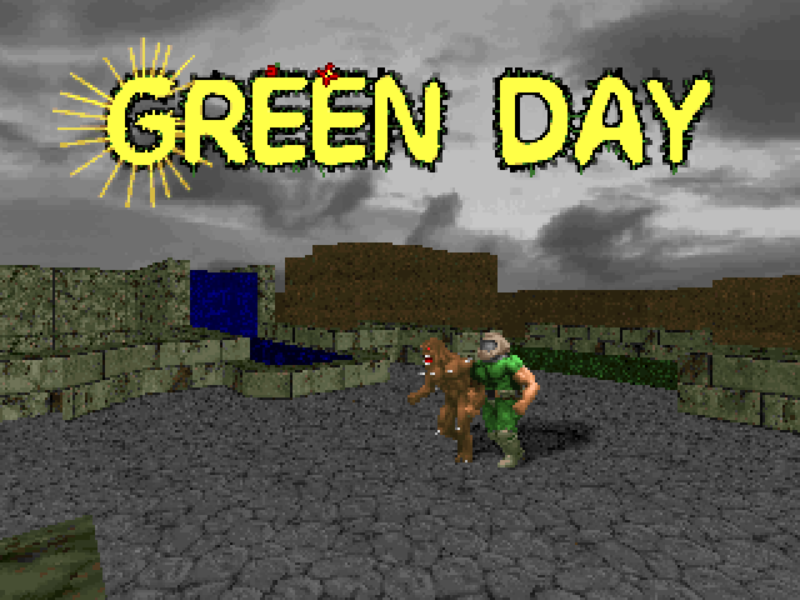 GREENDAY was placed in Episode Four and has some generic similarities, particularly the second level, but it isn't reminiscent of a Gothic Hellscape. The overall effect of using a healthy, green grass texture and a gray overcast sky is something more wholesome. The first map resembles a beautiful urban park and is better grounded in reality given its well, benches, and bamboo fencing. 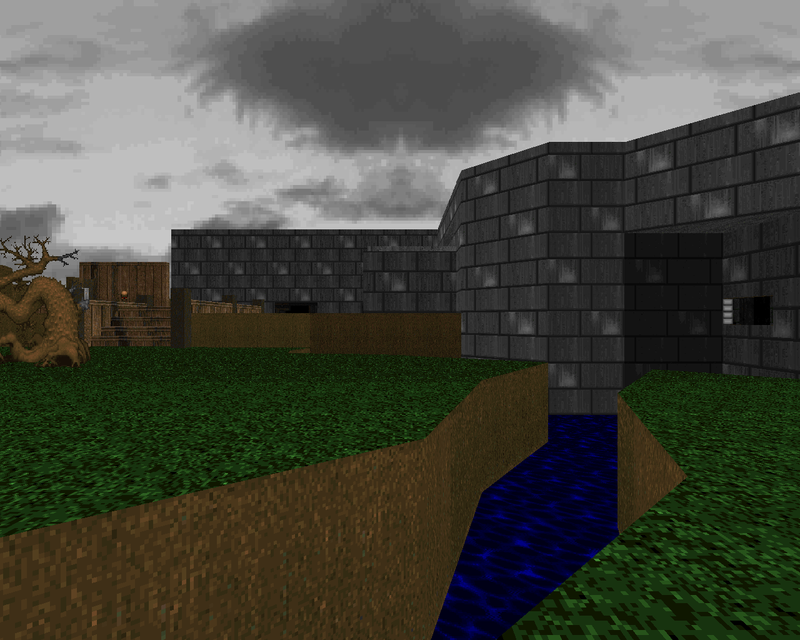 E4M2 is much more typical of a non-linear Doom level but the spots of green and skies of gray make all the Hellish imagery feel slightly less dire. 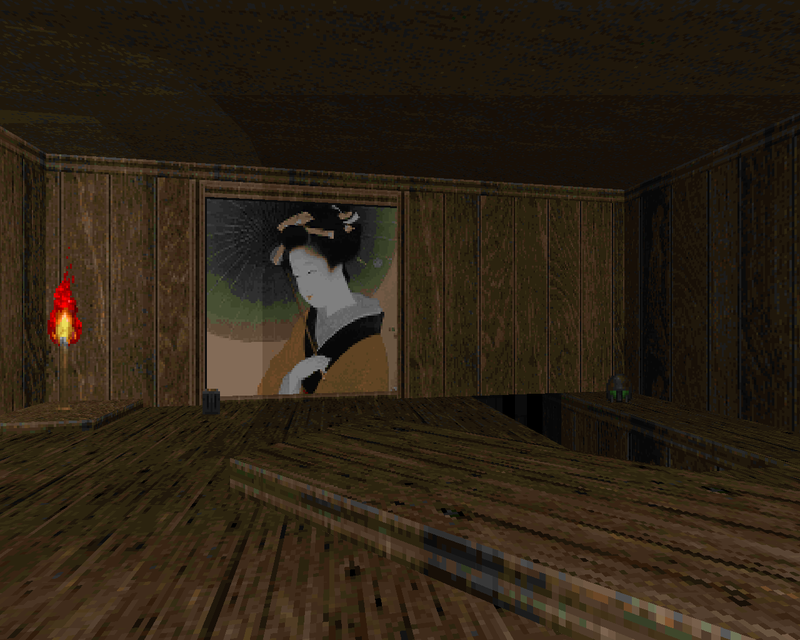 Each entry has its own little shack that sports a painting of presumably Japanese origin. To me the implied story has someone taking a walk in his or her neighborhood in glorious Nippon, stumbling across a couple of cacodemons, and then finding a demon citadel in the backyard. A lot of players chimed in to say that the ammo economy is pretty tight. What this actually boils down to is using your pistol to kill zombies during the short game when you haven't amassed a ton of shotgun ammunition. The overall balance is actually in your favor; I had around 40 shells by the time I exited E4M2 after a pistol start. Since you can't afford to squander them on the undead the difficulty arises from the increased time it takes to eliminate the hitscanners with your sidearm. The player is exposed to enemy attacks for a longer period during which health is chipped away, resulting in a battle of attrition. 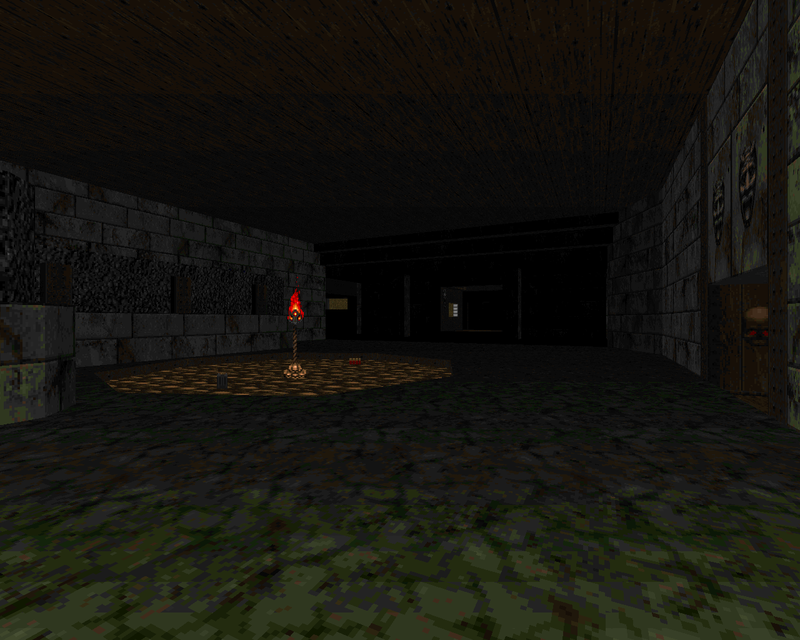 The main limiting factor is then the modicum of healing supplies stashed away in the disparate corners of the map. It's a delicate balancing act between cautious and casual. There aren't a great many memorable combat scenarios. The flow of E4M1 stands out because the cacodemons can easily follow you to the adjacent yard and the ammo is a bit more fine-tuned. E4M2's most dangerous area is probably the northern section but you'll feel the pain wherever you go unless you make the exercise a painstaking corridor crawl. There's also a room with stairs leading down into the water tunnels that could catch you off-guard. It makes for a moderately thrilling experience since the organic layout gives the monsters multiple avenues by which they can surprise you. The aesthetics are simple but pleasing. E4M1 feels more like an ode to the early 90s, mainly because it really focuses on the representation of something that could have easily come from the real world. The second one has a quasi corrupted-base / Thy Flesh Consumed aesthetic. Most of its geometry stands in contrast to the first map but the northern yard helps to tie the two together because of its terraces and shack with pulled up floor panel. That and the gray sky / green grass theme I previously mentioned. I'm not entirely sold on the bamboo fence but it feels pretty characteristic of 1994 in its application. 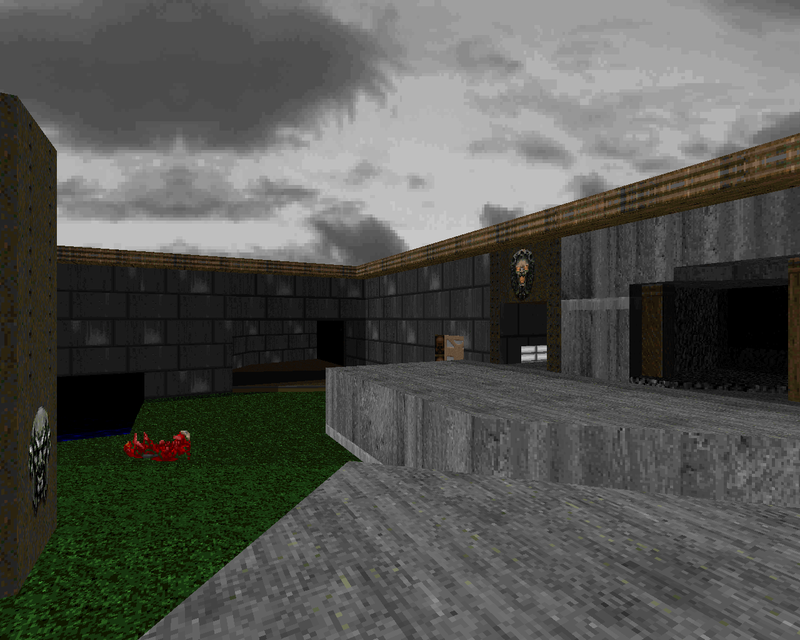 Green Day is a nice little pair of maps and should appeal to anyone looking for 1) Ultimate Doom levels that are challenging in spite of not using many if any of the bigger monsters or 2) the elusive '94-'95 feel. If you liked Kuchitsu then I would definitely dip back into this as long as you won't miss any of the Doom II monsters. Out in a nice little section of town. As an intro it gives off a bit of a "Hell Keep" vibe since you're immediately presented with a pair of cacodemons when you only have a pistol. Engineering a little infighting won't hurt but you shouldn't be too out of sorts as long as you make every shot count and check out the little asides like the back dock. The architecture is neat and I enjoy the park design of the western courtyard. The crazy tiger painting is pretty cool, too. The well and broken bucket are DoomCute to the core. 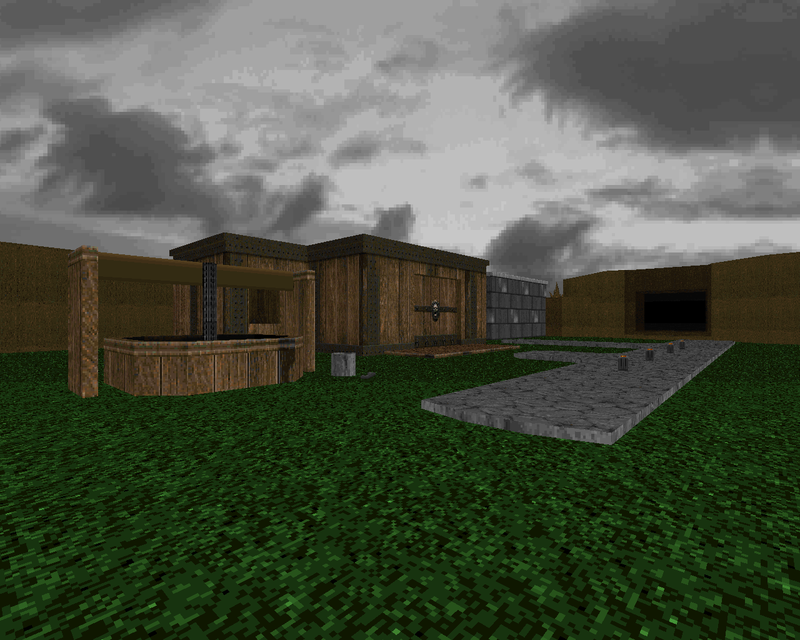 Ditching the urban environment for something approaching a marble and wood level but with a more positive look due to the gray sky and green grass. There isn't a lot of health but it's mostly low-tier monsters with a couple of cacodemons. You can play semi-quickly when you get a better idea of where the zombies are and prioritize them with the pistol. Before too long you'll have built up a ton of shells and wonder what all the fuss was about, even more so if you manage to beeline to the chainsaw. I like the layout; it's very interconnected and allows you to explore in several different directions. The tiered terraces remind me of Tony Sideris's works - specifically Debut.